Salamanca Tapas Bar & Restaurant is located just off Wicklow Street , on St Andrew's street, Dublin 1, And as the name suggest, this is a restaurant that celebrates Spanish Cuisine. The Spanish have succeeded in elevating pre-lunch or Dinner drinks and nibbles to irresistible heights and it is great to see many restaurants now in Dublin embracing this concept and offering us"Tapas", It is not always, that we wish to go and feast on a 3 course meal, hence I welcome this option. Having lived and worked in Spain for many years , eating tapas for me, goes hand in hand with hospitality, friendship and great conversation. It is a very sociable way to eat, whether among friends, a deux or en famille. A while back, in between meetings and gasping for a coffee , I popped into Salamanca and requested just that. I was greeted warmly and shown to a high table by the bar and served a great espresso .It was no problem at all, despite the fact, that it was only 2.30 pm and lunch was still going on . I was impressed and I recently returned to sample their food for the first time . With Head Chef Raffa, a true Spaniard from Granada, Salamanca is aiming to elevate it's menu to new heights, while offering good value for money. 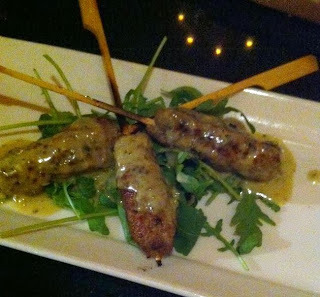 The €10 lunch menu, will see you with a main and a glass of wine and The early bird menu @€16.95 offers a choice of 3 tapas and glass of wine for an extra €3 only and Cocktails a steal at a mere €7. 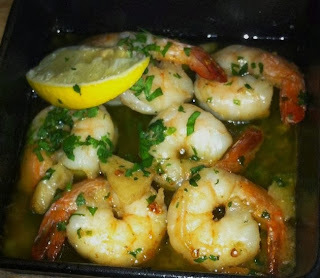 This is a vast menu , with the usual array of hot or cold tapas, from green and black olives marinated in herd and spice infused oils, crunchy roasted almonds coated in coarse sea salt and smoked paprika, sizzling prawns , brochettes of assorted fish , chunks of juicy steaks and chorizo.... I counted nothing short than 58 dishes , making choosing the right one a difficult task. The décor and style at play, has managed to infuse a warm, rustic and inviting quality to the place. With bare floor boards, a mosaic clad bar, sunflower yellow and terracotta painted walls , evokes memories of Spanish tavernas and warmth. However, space was a bit cramped, with tables way too close together . Service was very efficient and friendly . It was a Saturday night, when we visited and the place was buzzing and packed to the rafters. It has been a long time since I saw so many people being turned away. But in true Spanish style , if it is busy , it must be good. Brocheta de Cordero @€6.95 were chargrilled minced lamb skewers , looking very similar to lollipops in a coconut and lemon grass sauce, juicy, full of flavour and very tasty indeed. 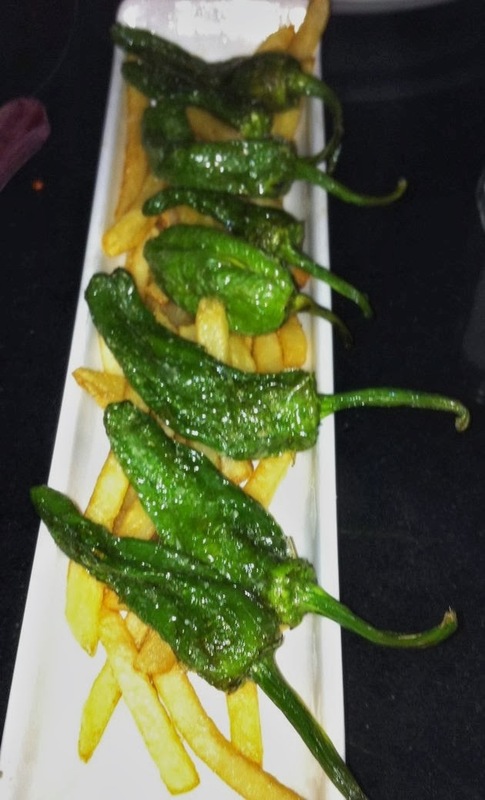 Pimientos de padron @€7.50 were fried padron peppers in olive oil and coarse sea salt, just enough to blister the skin while retaining it's bite and hopefully its heat. I love them and are de rigeure for me when in Spain, normally sweet and mild but sometimes they can be spicy and hot. 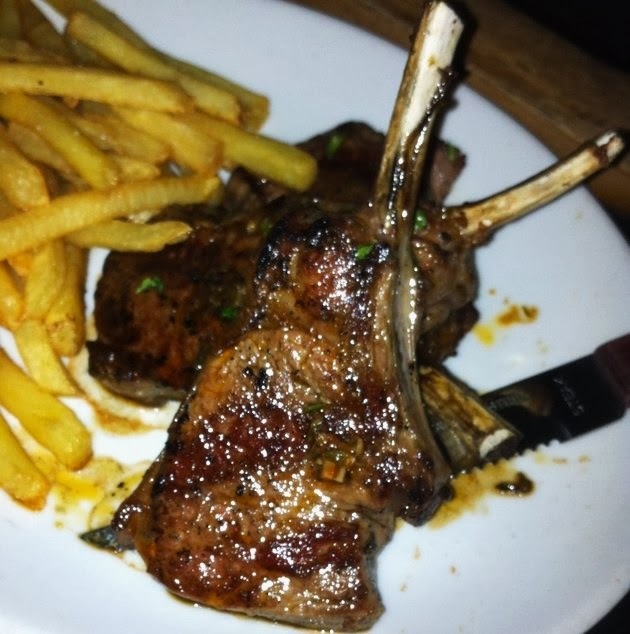 Chuletitas de Cordero @€13.95 were chargrilled lamb cutlets with Chimi Churri sauce. They were beautifully cooked, tender and moist.One could taste the garlic and Spanish oregano marinade and the meat just fell off the bone, nicely charred to give a hint of smokiness. Delicious. Gambas al pil pil @€11.95 were succulent king prawns in a spiced infused olive oil , with garlic, chilli and brandy, What's not to love and this is the kind of simple food that makes tapas great. Lots of crusty bread was used to soak up all that wonderful sauce. 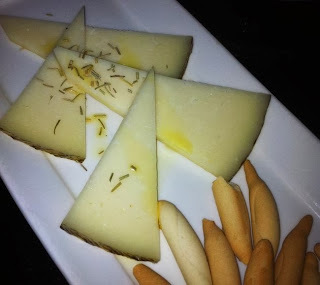 Manchego cheese, this firm cheese made from sheep milk, with a drizzle of olive oil and rosemary, was creamy and strong flavoured. Perfect with the strong bodied Torres Salmos Priorat red we were sipping. We really enjoyed the food . It was simple, beautifully cooked , devoid of any pretence and very tasty. The friendly atmosphere of the place was also contagious and I was still humming the Gypsy king tunes on our way home.